Sir Hugh Orde joined the Metropolitan Police Service in 1977 and served in central, south and west London before taking command of the Territorial Support Group as a Superintendent. He was appointed Commander (Crime) for southwest London in June 1998 and in April 1999 was the officer in command of the investigation into the racially motivated Brixton bombing in which 50 people were injured. As Commander he also developed Operation Trident, an operation set up to deal with serious drugs related crime in London. He was promoted to Deputy Assistant Commissioner in October 1999 and was given day-to-day responsibility for the Commissioner’s Enquiry (Stevens III) into collusion and the murder of a prominent solicitor in Northern Ireland. In September 2002 Sir Hugh was appointed Chief Constable of the Police Service of Northern Ireland (PSNI), a position he held for seven years. During his time in Northern Ireland he reformed the police force increasing Catholic recruitment, established the HET- the Historical Enquiries Team, made significant inroads into peace with the end of the IRA threat and won the support of unprecedented numbers of nationalists and Catholics. His work in Northern Ireland also saw him forge strong political links with America. 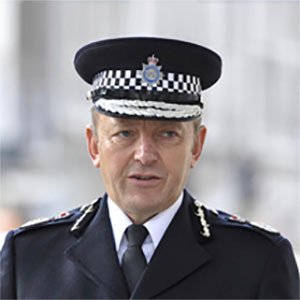 Sir Hugh was appointed vice-president of the Association of Chief Police Officers in 2006 and in 2009 he became its president entrusted by his chief officer colleagues to steer policing in England, Wales and Northern Ireland into the 21st century. Sir Hugh Orde was awarded an OBE in 2001 for services to policing, and in 2005 was knighted for his work. In 2008 he was awarded the annual Leadership Award from the Police Executive Research Forum recognising his work in changing policing in Northern Ireland following the Good Friday Agreement in 1998. In 2010 he was awarded a Queen’s Police Medal for services to policing.